Based in Positano, its perfumes inspired by Italy — Baume du Doge (Venice), Bois d’Ombrie (Umbria), Eau d’Italie (Positano), Magnolia Romana (Rome), Paestum Rose (Paestum) and Sienne l’Hiver (Siena) — niche line Eau d’Italie’s fragrance names are in French (Perché? Do more people know how to pronounce French than Italian? Are French titles more “perfume-y”?) Eau d’Italie also uses a French perfumer, Bertrand Duchaufour, to create many of its fragrances, and I’ve enjoyed (almost) all of his Eau d’Italie perfumes (Magnolia Romana excepted). The inspiration for this fragrance is a tale from a bygone era, when nations were ruled by poets, and poets were sacred to Apollo. In those days Sicily was a Greek colony, Syracuse was a fragrant court, and its gardens vibrated with the scent of citrus orchards and rows of aromatic plants. Thus "Jardin du Poete", the poet's garden, a luminous fragrance to evoke Sicily and all things Sicilian. It would require another article to tackle the confused notions expressed in that PR blip, but I’ll take Eau d’Italie at its word when it states it wanted Jardin du Poète to be “deliciously original and uncompromisingly contemporary.” Jardin du Poète succeeds on one of those two counts. Jardin du Poète’s listed notes include bitter orange, grapefruit, basil, angelica, immortelle (Helicrysum italicum), pink pepper, cypress, vetiver and musk. Jardin du Poète’s development proceeds from a tangerine peel-grapefruit juice opening to fresh, not musty, immortelle blended with some “greens” and crystallized angelica in mid-development, and ends with mildest vetiver mixed with faint cypress. At times during Jardin du Poète’s dry-down, I detect a ‘vegetal’ aroma that reminds me of bell peppers and tomato leaf. In the end, Jardin du Poète smells like a thirst-quenching, naturally sweet (non-alcoholic) cocktail — juicy, sparkling and cool at first sip, but with a “warm” herbal aftertaste. Jardin du Poète is delicious, but certainly not “deliciously original.” (It’s no L’Artisan Timbuktu or Dzongkha, to name just two of Duchaufour’s more quirky creations outside the Eau d’Italie line.) Given many of its ‘Eau de Cologne’ notes, Jardin du Poète could easily have been a simple, old-fashioned fragrance — the type of scent I associate with Italian monks and monasteries via quite a few Italian niche lines — but Jardin du Poète’s bold freshness, its realistic ‘herbs’, its radiance and tenacity, do make it smell “uncompromisingly contemporary.” If my perfume cabinet didn’t already overflow with summer-y colognes, I’d buy Jardin du Poète. Jardin du Poète has good lasting power and minimal sillage. On my skin, the note that is most enduring is immortelle. I love immortelle when it’s expertly blended into a fragrance, but many people I know consider this note “stale,” so your pleasure in Jardin du Poète may depend on your love, or dislike, of immortelle. 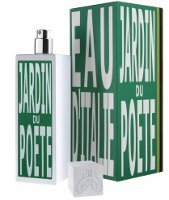 Eau d’Italie Jardin du Poète is available in 100 ml Eau de Toilette, $140; for buying information, see the listing for Eau d'Italie under Perfume Houses. 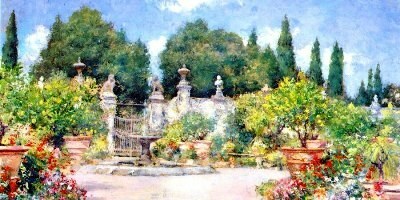 Note: top image is An Italian Garden by William Merritt Chase [cropped] via Wikimedia Commons. This sounds nice, Kevin … I need to get samples of the others in this line. More than that, I would like to be sitting in that Italian garden. That painting truly IS the “Jardin du Poète”! Labben: it was HARD for me not to buy a bottle…maybe by next summer I’ll have some “openings” in the perfume cabinet. I always expect great things from Duchaufour and am rarely disappointed. This, for me, was one of those rare cases. On my skin the freshness, which is certainly there, came across as overly synthetic. Too bad, because there were a lot of other things to like about it. Even when Duchaufour misses for me, his misses are still more interesting than the vast majority of other scents out there. Kathryn: thankfully, the “freshness” was under control on me. Kevin: Thanks for the nice review. I love more interesting types of colognes (esp. in this heat!). I like immortelle – even to the degree of AG sables – and angelica, et. al. I will definitely have to test this one. Anns: it’s worth a try. I so wanted to love this. Duchaufour, the notes, the line in general – what could go wrong? Unfortunately, this had a very waterly feel on me, not really ozonic, just wet. Such a shame, I thought I might find the perfect summer citrus. In UJdP I perceive the freshness as coming from the basil note? When I smell fresh basil on its own it almost makes me feel nauseous, but at the same time I am drawn to it! In some food (insalata caprese) and in this perfume, mixed with other notes the acquatious note is balanced. Had I smelled UJdP two years ago, I would probably have dismissed it as too fresh. Kristin: I won’t pity you…there are, what?, THOUSANDS of others to choose from! HA! Kevin, I just tried this and agree with you that it’s delicious! For me the herbal part seemed to “carry” the wonderful, almost bitter citrus notes, making them last longer. I think I’m going to add this one to my FB wish list! Haunani: glad you enjoyed it. I did enjoy sampling this fragrance… it gave me the feeling of walking through an herb garden and then a plant nurse. William Merit Chase is the perfect image/artist choice… not original, but delicious! … that is, plant NURSERY. Where you buy plants for your garden. Jessica: HAHAHAHA! Walking thru a plant nurse would probably smell more like Secretions Magnifiques, no? Ha ha! Jessica, for me it was like walking through a citrus grove, and then an herb garden, with a few cut flowers thrown in. If it smells like that lovely painting, and you, Jessica and Haunani all enjoy it – that makes it a must try for me! Thanks for a refreshing post, Kevin. I haven’t tried anything from this line and it might be time. This is getting good reviews pretty much straight across the board. I’m not sure what to make of that two years of intense development, because it seems like BD has his fingers in many pies. Maybe he met with these people once a month for two years or something, while elsewhere he was working on 14 different things. It is quite lovable fragrance and if I would have some extra money to spend I’d buy it. I even liked the tomato leaves in it. They are blended in just the right way. What’s that painting I truely love it! ?